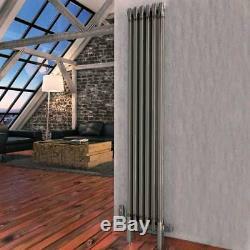 HB Signature Metalico Raw Metal Vertical Column Radiators. Manufactured in accordance with BS EN 442. Supplied with wall mounting brackets and fixings. Why hide your radiator away when you can turn it into a stunning design feature? The Metalico Vertical Column radiator is a real statement piece finished with a unique, lacquered raw metal look that not only heats your home efficiently, but also acts as its own focal design point in any modern room. The lacquered finish is a truly'rustic' Italian design, and unique to this brand. A vertical column radiator of this stature means that heat is more evenly distributed around a space, and because its dimensions mean that it can be used in any narrow location, it won't impact on your overall floor space either. Constructed from high-grade steel, it's lightweight, strong and warms up any space quickly. All our radiators are CE approved and certified EN442, which means the advertised heat output is exactly what you'll get. A 15-year guarantee also gives you total peace of mind. The Metalico is a contemporary masterpiece and ideal for on-trend home or workplace interiors. Range of standard and thermostatic valves available separately. Designer Column Radiators - Explained! Column Radiators use both Radiant and Convective methods to heat your room. Unlike the Convector's, Column Radiators do not contain Fins but do still have a large service area for the cool air to come into contact with and change into hot air. The Columns are designed to have spaces in between them so that there is plenty of room for the air to travel and become warm. The increase in Column number also means an increase in projection from the wall that the Radiator will be placed against, this is something to bear in mind when choosing a Column Radiator for your home. You should also consider the amount of space that will be left around the radiator as Columns perform best when there is open space around them for the air to flow. 1500mm x 290mm 2 Column. 1500mm x 480mm 2 Column. 1800mm x 290mm 2 Column. 1800mm x 480mm 2 Column. Please allow extra time if you are paying by cheque. Or you can collect from us. This means that you do not have to wait in until your goods arrive. We therefore respectfully ask that you do not arrange for a plumber or other tradesperson to fit your goods until you have received and checked your order. When your order arrives, you will be asked to sign to say that you have received the goods and that they are in good condition. Please check both the external packaging and the product inside for any damage. We will arrange for a replacement item to be delivered to you as soon as possible, at which time the damaged item will be collected and taken away by the driver. The type of valves that you need will depend on the configuration of your pipework. If the towel rail / radiator has connections at the bottom. You will need either angled or straight valves. Angled if your pipes are coming from the wall as this will provide a 90 degree angle up into the bottom of the towel rail / radiator, straight if your pipes are coming from the floor and just need to go straight up into the bottom of the towel rail / radiator. If the towel rail / radiator has connections at the sides. You will need either angled or corner valves, angled if your pipes are coming from the floor as this will provide a 90 degree angle into the side of the radiator. Corner Valves if your pipes are coming from the wall this will also give a 90 degree angle into the side of the radiator however is the neatest solution with this type of configuration. The item "Raw Metal Vertical Column Radiators Central Heating 15 Year Guarantee" is in sale since Friday, September 1, 2017. This item is in the category "Home, Furniture & DIY\Heating, Cooling & Air\Air Conditioners & Heaters\Radiators".